For related content, see genetically modified food controversies, genetic engineering, genetically modified crops, and genetically modified food. Is an organism whose genetic material has been altered using genetic engineering techniques. Organisms that have been genetically modified include micro-organisms such as bacteria and yeast, insects, plants, fish, and mammals. GMOs are the source of genetically modified foods and are also widely used in scientific research and to produce goods other than food. The term GMO is very close to the technical legal term, 'living modified organism' defined in the Cartagena Protocol on Biosafety, which regulates international trade in living GMOs (specifically, "any living organism that possesses a novel combination of genetic material obtained through the use of modern biotechnology"). This article focuses on what organisms have been genetically engineered, and for what purposes. The article on genetic engineering focuses on the history and methods of genetic engineering, and on applications of genetic engineering and of GMOs. Both articles cover much of the same ground but with different organizations (sorted by organism in this article; sorted by application in the other). There are separate articles on genetically modified crops, genetically modified food, regulation of the release of genetic modified organisms, and controversies. Production Further information: genetic engineering, Genetic genetic modification, horizontal gene transfer, molecular cloning, recombinant DNA and transformation (genetics) Genetic modification involves the mutation, insertion, or deletion of genes. Inserted genes usually come from a different species in a form of horizontal gene-transfer. In nature this can occur when exogenous DNA penetrates the cell membrane for any reason. To do this artificially may require: attaching the genes to a virus physically inserting the extra DNA into the nucleus of the intended host with a very small syringe with the use of electroporation (that is, introducing DNA from one organism into the cell of another by use of an electric pulse) with very small particles fired from a gene gun. Other methods exploit natural forms of gene transfer, such as the ability of Agrobacterium to transfer genetic material to plants, or the ability of lentiviruses to transfer genes to animal cells. History Main article: History of genetic engineering The general principle of producing a GMO is to alter the genetic material of an organism's genome. Genetic modification caused by human activity has been occurring since humans first domesticated animals in 12,000 BC. and plants around 10,000 BC. Genetic engineering, the direct transfer of DNA from one organism to another, was first accomplished by Herbert Boyer and Stanley Cohen in 1973. Advances have allowed scientists to manipulate and add genes to a variety of different organism and to induce a range of different effects. Since 1976 the technology has been commercialized, with companies producing and selling genetically modified food and medicine. This may involve mutating, deleting, or adding genetic material. When genetic material from a different species is added, the resulting DNA is called recombinant DNA and the organism is called a transgenic organism. The first recombinant DNA molecules were produced by Paul Berg in 1972. Uses GMOs are used in biological and medical research, production of pharmaceutical drugs, experimental medicine (e.g. gene therapy), and agriculture (e.g. golden rice, resistance to herbicides). The term "genetically modified organism" does not always imply, but can include, targeted insertions of genes from one species into another. For example, a gene from a jellyfish, encoding a fluorescent protein called GFP, can be physically linked and thus co-expressed with mammalian genes to identify the location of the protein encoded by the GFP-tagged gene in the mammalian cell. Such methods are useful tools for biologists in many areas of research, including those who study the mechanisms of human and other diseases or fundamental biological processes in eukaryotic or prokaryotic cells. Microbes Bacteria were the first organisms to be modified in the laboratory, due to their simple genetics. They continue to be important model organisms for experiments in genetic engineering. In the field of synthetic biology, they have been used to test various synthetic approaches, from synthesizing genomes to creating novel nucleotides. These organisms are now used for several purposes, and are particularly important in producing large amounts of pure human proteins for use in medicine. Genetically modified bacteria are used to produce the protein insulin to treat diabetes. Similar bacteria have been used to produce biofuels, clotting factors to treat haemophilia, and human growth hormone to treat various forms of dwarfism. In addition, various genetically engineered micro-organisms are routinely used as sources of enzymes for the manufacture of a variety of processed foods. These include alpha-amylase from bacteria, which converts starch to simple sugars, chymosin from bacteria or fungi, which clots milk protein for cheese making, and pectinesterase from fungi, which improves fruit juice clarity. Plants Transgenic plants Transgenic plants have been engineered for scientific research, to create new colours in plants, and to create different crops. In research, plants are engineered to help discover the functions of certain genes. One way to do this is to knock out the gene of interest and see what phenotype develops. Another strategy is to attach the gene to a strong promoter and see what happens when it is over expressed. A common technique used to find out where the gene is expressed is to attach it to GUS or a similar reporter gene that allows visualisation of the location. Suntory "Blue" Rose. After thirteen years of collaborative research, an Australian company – Florigene, and a Japanese company – Suntory, created a blue rose (actually lavender or mauve) in 2004. The genetic engineering involved three alterations – adding two genes, and interfering with another. One of the added genes was for the blue plant pigment delphinidin cloned from the pansy. The researchers then used RNA interference (RNAi) technology to depress all color production by endogenous genes by blocking a crucial protein in color production, called dihydroflavonol 4-reductase) (DFR), and adding a variant of that protein that would not be blocked by the RNAi but that would allow the delphinidin to work. The roses are sold worldwide. Florigene has also created and sells lavender-colored carnations that are genetically engineered in a similar way. Simple plants and plant cells have been genetically engineered for production of biopharmaceuticals in bioreactors as opposed to cultivating plants in open fields. Work has been done with duckweed Lemna minor, the algae Chlamydomonas reinhardtii and the moss Physcomitrella patens. An Israeli company, Protalix, has developed a method to produce therapeutics in cultured transgenic carrot and tobacco cells. Protalix and its partner, Pfizer, received FDA approval to market its drug Elelyso, a treatment for Gaucher's disease, in 2012. GM crops Main article: Genetically modified crops In agriculture, currently marketed genetically engineered crops have traits such as resistance to pests, resistance to herbicides, increased nutritional value, or production of valuable goods such as drugs (pharming). Products under development include crops that are able to thrive in environmental conditions outside the species' native range or in changed conditions in their range (e.g. drought or salt resistance). Products that existed and have been withdrawn include those with extended product shelf life, such as the Flavr-savr tomato. Since the first commercial cultivation of genetically modified plants in 1996, they have been modified to be tolerant to the herbicides glufosinate and glyphosate, to be resistant to virus damage (as in Ringspot virus-resistant GM papaya grown in Hawaii), and to produce the Bt toxin, an insecticide that is documented as non-toxic to mammals. Plants, including algae, jatropha, maize, and poplars, have been genetically modified for use in producing fuel, known as biofuel. Second- and third-generation GM crops are on the market and under development with improved nutrition profiles and increased yields or ability to thrive in difficult environments. GM oilseed crops on the market today offer improved oil profiles for processing or healthier edible oils. Other examples include: A genetically modified cassava with lower cyanogen glucosides and enhanced with protein and other nutrients; Golden rice, which was developed by the International Rice Research Institute (IRRI) and has been discussed as a possible cure for Vitamin A deficiency; A vitamin-enriched corn derived from South African white corn variety; Camelina sativa that accumulates high levels of oils similar to fish oils. For discussions of issues about GM crops and GM food, see the Controversies section below and the article on genetically modified food controversies. Cisgenic plants Cisgenesis, sometimes also called intragenesis, is a product designation for a category of genetically engineered plants. A variety of classification schemes have been proposed that order genetically modified organisms based on the nature of introduced genotypical changes rather than the process of genetic engineering. While some genetically modified plants are developed by the introduction of a gene originating from distant, sexually incompatible species into the host genome, cisgenic plants contain genes that have been isolated either directly from the host species or from sexually compatible species. The new genes are introduced using recombinant DNA methods and gene transfer. Some scientists hope that the approval process of cisgenic plants might be simpler than that of proper transgenics, but it remains to be seen. Mammals Some chimeras, like the blotched mouse shown, are created through genetic modification techniques like gene targeting. Genetically modified mammals are an important category of genetically modified organisms. Ralph L. Brinster and Richard Palmiter developed the techniques responsible for transgenic mice, rats, rabbits, sheep, and pigs in the early 1980s, and established many of the first transgenic models of human disease, including the first carcinoma caused by a transgene. The process of genetically engineering animals is a slow, tedious, and expensive process. However, new technologies are making genetic modifications easier and more precise. The first transgenic (genetically modified) animal was produced by injecting DNA into mouse embryos then implanting the embryos in female mice. Genetically modified animals currently being developed can be placed into six different broad classes based on the intended purpose of the genetic modification: to research human diseases (for example, to develop animal models for these diseases); to produce industrial or consumer products (fibres for multiple uses); to produce products intended for human therapeutic use (pharmaceutical products or tissue for implantation); to enrich or enhance the animals' interactions with humans (hypo-allergenic pets); to enhance production or food quality traits (faster growing fish, pigs that digest food more efficiently); to improve animal health (disease resistance) Research use Transgenic animals are used as experimental models to perform phenotypic and for testing in biomedical research. Genetically modified (genetically engineered) animals are becoming more vital to the discovery and development of cures and treatments for many serious diseases. By altering the DNA or transferring DNA to an animal, we can develop certain proteins that may be used in medical treatment. Stable expressions of human proteins have been developed in many animals, including sheep, pigs, and rats. Human-alpha-1-antitrypsin, which has been tested in sheep and is used in treating humans with this deficiency and transgenic pigs with human-histo-compatibility have been studied in the hopes that the organs will be suitable for transplant with less chances of rejection. Scientists have genetically engineered several organisms, including some mammals, to include green fluorescent protein (GFP) for medical research purposes (Chalfie, Shimoura, and Tsien were awarded the Nobel prize in 2008 for GFP. For example fluorescent pigs have been bred in the US in 2000, in Korea in 2002, in Taiwan in 2006, in China in 2008 and Japan in 2009. These pigs were bred to study human organ transplants, regenerating ocular photoreceptor cells, neuronal cells in the brain,[ regenerative medicine via stem cells, tissue engineering, and other diseases. In 2011 a Japanese- American Team created green-fluorescent cats in order to find therapies for HIV/AIDS and other diseases as Feline immunodeficiency virus (FIV) is related to HIV. In 2009, scientists in Japan announced that they had successfully transferred a gene into a primate species (marmosets) and produced a stable line of breeding transgenic primates for the first time. Their first research target for these marmosets was Parkinson's disease, but they were also considering Amyotrophic lateral sclerosis and Huntington's disease. Producing human therapeutics Within the field known as pharming, intensive research has been conducted to develop transgenic animals that produce biotherapeutics. On 6 February 2009, the U.S. Food and Drug Administration approved the first human biological drug produced from such an animal, a goat. The drug, ATryn, is an anticoagulant which reduces the probability of blood clots during surgery or childbirth. It is extracted from the goat's milk. Production or food quality traits Enviropig was a genetically enhanced line of Yorkshire pigs in Canada created with the capability of digesting plant phosphorus more efficiently than conventional Yorkshire pigs. The project ended in 2012. These pigs produced the enzyme phytase, which breaks down the indigestible phosphorus, in their saliva. The enzyme was introduced into the pig chromosome by pronuclear microinjection. With this enzyme, the animal is able to digest cereal grain phosphorus. The use of these pigs would reduce the potential of water pollution since they excrete from 30 to 70.7% less phosphorus in manure depending upon the age and diet. The lower concentrations of phosphorus in surface runoff reduces algal growth, because phosphorus is the limiting nutrient for algae. Because algae consume large amounts of oxygen, it can result in dead zones for fish. In 2011, Chinese scientists generated dairy cows genetically engineered with genes for human beings to produce milk that would be the same as human breast milk. This could potentially benefit mothers who cannot produce breast milk but want their children to have breast milk rather than formula. Aside from milk production, the researchers claim these transgenic cows to be identical to regular cows. Two months later scientists from Argentina presented Rosita, a transgenic cow incorporating two human genes, to produce milk with similar properties as human breast milk. In 2012, researchers from New Zealand also developed a genetically engineered cow that produced allergy-free milk. In 2006, a pig was engineered to produce omega-3 fatty acids through the expression of a roundworm gene. Goats have been genetically engineered to produce milk with strong spiderweb-like silk proteins in their milk. Genetically modified fish have been developed with promoters driving an over-production of growth hormone for use in the aquaculture industry to increase the speed of development and potentially reduce fishing pressure on wild stocks. AquaBounty, a biotechnology company working on bringing a GM salmon to market, claims that their GM AquAdvantage salmon can mature in half the time it takes non-GM salmon and achieves twice the size. AquaBounty has applied for regulatory approval to market their GM salmon in the US. As of May 2012 the application was still pending. On 25 November 2013 Canada approved commercial scale production and export of GM Salmon eggs but they are not approved for human consumption in Canada. Human gene therapy Gene therapy, uses genetically modified viruses to deliver genes that can cure disease in humans. Although gene therapy is still relatively new, it has had some successes. It has been used to treat genetic disorders such as severe combined immunodeficiency, and Leber's congenital amaurosis. Treatments are also being developed for a range of other currently incurable diseases, such as cystic fibrosis, sickle cell anemia, Parkinson's disease, cancer, diabetes, heart disease and muscular dystrophy. Current gene therapy technology only targets the non-reproductive cells meaning that any changes introduced by the treatment can not be transmitted to the next generation. Gene therapy targeting the reproductive cells—so-called "Germ line Gene Therapy"—is very controversial and is unlikely to be developed in the near future. Insects Fruit flies In biological research, transgenic fruit flies (Drosophila melanogaster) are model organisms used to study the effects of genetic changes on development. Fruit flies are often preferred over other animals due to their short life cycle, low maintenance requirements, and relatively simple genome compared to many vertebrates. Mosquitoes In 2010, scientists created "malaria-resistant mosquitoes" in the laboratory. The World Health Organization estimated that Malaria killed almost one million people in 2008. Genetically modified male mosquitoes containing a lethal gene have been developed in order to combat the spread of Dengue fever. Aedes aegypti mosquitoes, the single most important carrier of dengue fever, were reduced by 80% in a 2010 trial of these GM mosquitoes in the Cayman Islands. Between 50 and 100 million people are affected by Dengue fever every year and 40,000 people die from it. Bollworms A strain of Pectinophora gossypiella (Pink bollworm) has been developed that contains a fluorescent marker in their DNA. This allows researchers to monitor bollworms that have been sterilized by radiation and released in order to reduce bollworm infestation. Aquatic life Cnidarians Cnidarians such as Hydra and the sea anemone Nematostella vectensis have become attractive model organisms to study the evolution of immunity and certain developmental processes. An important technical breakthrough was the development of procedures for generation of stably transgenic hydras and sea anemones by embryo microinjection. Fish GM fish are used for scientific research and as pets, and are being considered for use as food and as aquatic pollution sensors. Genetically engineered fish are widely used in basic research in genetics and development. Two species of fish, zebrafish and medaka, are most commonly modified because they have optically clear chorions (shells), rapidly develop, and the 1-cell embryo is easy to see and microinject with transgenic DNA. 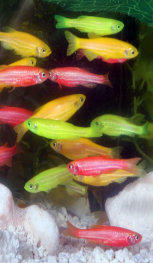 The GloFish is a patented brand of genetically modified (GM) fluorescent zebrafish with bright red, green, and orange fluorescent color. Although not originally developed for the ornamental fish trade, it became the first genetically modified animal to become publicly available as a pet when it was introduced for sale in 2003. They were quickly banned for sale in California. Genetically modified fish have been developed with promoters driving an over-production of "all fish" growth hormone for use in the aquaculture industry to increase the speed of development and potentially reduce fishing pressure on wild stocks. This has resulted in dramatic growth enhancement in several species, including salmon, trout and tilapia. AquaBounty, a biotechnology company working on bringing a GM salmon to market, claims that their GM AquAdvantage salmon can mature in half the time it takes non-GM salmon and achieves twice the size. AquaBounty has applied for regulatory approval to market their GM salmon in the US. As of December 2012 the application was still pending. Several academic groups have been developing GM zebrafish to detect aquatic pollution. The lab that originated the GloFish discussed above originally developed them to change color in the presence of pollutants, to be used as environmental sensors. A lab at University of Cincinnati has been developing GM zebrafish for the same purpose, as has a lab at Tulane University. Regulation Main articles: Regulation of genetic engineering and Regulation of the release of genetically modified organisms The regulation of genetic engineering concerns the approaches taken by governments to assess and manage the risks associated with the use of genetic engineering technology and the development and release of genetically modified organisms (GMO), including genetically modified crops and genetically modified fish. There are differences in the regulation of GMOs between countries, with some of the most marked differences occurring between the USA and Europe. Regulation varies in a given country depending on the intended use of the products of the genetic engineering. For example, a crop not intended for food use is generally not reviewed by authorities responsible for food safety. The European Union differentiates between approval for cultivation within the EU and approval for import and processing. While only a few GMOs have been approved for cultivation in the EU a number of GMOs have been approved for import and processing. The cultivation of GMOs has triggered a debate about coexistence of GM and nonGM crops. Depending on the coexistence regulations, incentives for cultivation of GM crops differ. Controversy Main article: Genetically modified food controversies There is controversy over GMOs, especially with regard to their use in producing food. The dispute involves consumers, biotechnology companies, governmental regulators, non-governmental organizations, and scientists. The key areas of controversy related to GMO food are whether GM food should be labeled, the role of government regulators, the effect of GM crops on health and the environment, the effect on pesticide resistance, the impact of GM crops for farmers, and the role of GM crops in feeding the world population. There is broad scientific consensus that food on the market derived from GM crops poses no greater risk than conventional food. No reports of ill effects have been proven in the human population from ingesting GM food. Although labeling of GMO products in the marketplace is required in many countries, it is not required in the United States and no distinction between marketed GMO and non- GMO foods is recognized by the US FDA. Opponents of genetically modified food such as the advocacy groups Organic Consumers Association, the Union of Concerned Scientists, and Greenpeace claim risks have not been adequately identified and managed, and they have questioned the objectivity of regulatory authorities. Some health groups say there are unanswered questions regarding the potential long-term impact on human health from food derived from GMOs, and propose mandatory labeling. or a moratorium on such products. Concerns include contamination of the non-genetically modified food supply, effects of GMOs on the environment and nature, the rigor of the regulatory process, and consolidation of control of the food supply in companies that make and sell GMOs. Recognition of the originators of GM crops On June 19, 2013 the leaders of the three research teams that first applied genetic engineering to crops, Robert T. Fraley of Monsanto; Marc Van Montagu of Ghent University in Belgium and founder of Plant Genetic Systems and Crop Design; and Mary-Dell Chilton of the University of Washington and Washington University in St. Louis and Syngenta, were awarded with the World Food Prize. 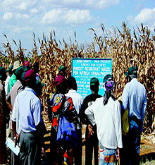 The prize, of $250,000, is awarded to people who improve the "quality, quantity or availability" of food in the world. The three competing teams first presented their results in January 1983. 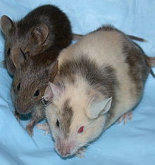 Some chimeras, like the blotched mouse shown, are created through genetic modification techniques like gene targeting.